David Martín starts off impoverished, living in a grotty 'pensión' in Barcelona. His late father's friend, Pedro Vidal, knows that Martín wants to be a writer, so he uses his connections to get his young friend a job writing the fiction pages of the newspaper, 'The Voice of Industry'. After some modest success, the editor of the paper allows Martín to write a regular serial, giving him the confidence he sorely needs to progress into the world of authorship. We see Martín go on to write books in a series for a publishing house that completely rips him off, but under a pseudonym. Working all day and all night, our protagonist works himself almost to death and manages to amass a fair amount of money - enough to leave his dire dwelling and move into an abandoned house - the Tower house he calls it. He always walked past it as a child and somehow always knew he would live there. Everyone says the place is haunted, but that does not deter Martín, and only spurs him on to write more fervently about the imagined crimes of the streets of Barcelona. Pedro Vidal stays in touch with our young writer, giving him the encouragement he needs. Meanwhile, Martín falls in love with Vidal's chauffeur's daughter, Cristina. However, Pedro Vidal has already told him that she can't stand his work and thinks he's throwing his life away. It is a confusing, emotional time for Martín, when he is suddenly contacted by a French publisher by the name of Andreas Corelli, offering to help him in his career. From then on, strange things start to happen. I would class this novel as a mystery of sorts. The house has strange smells, strange feelings and atmospheres. When Martín is told something awful will happen to him which will stop him writing like a madman, he is made an offer by Corelli which he cannot refuse. One might say he sells his soul... Strange things happen in the house, but also to his friends and acquaintances. Soon Martín finds himself on a trail of what happened to the man who wrote a novel in his Tower house, on the typewriter left behind. The man is Diego Marlasca, and Martín's investigations into Marlasca are unnerving (not to mention the fact that they share the same initials), and crises seem to befall everyone Martín talks to about Marlasca. I enjoyed the parts of the book which mentioned the Cemetery of Forgotten Books. This book is actually number 2 in the series of that same name, even though the appearance of the Cemetery in this novel is brief, and relates very little to the story. It is not necessary at all to have read the first book, but the Cemetery is a nice little touch for readers of 'The Shadow of the Wind'. Honestly, this novel kept me gripped from the very start. I know that sounds clichéd, but it is true. We are drawn into Martín's intense and emotional life, which we can feel is quickly spiralling and wasting away before his eyes, whilst being terribly exciting. Martín is our narrator, which gives the story an urgency that we must follow. His life seems ideal, typing away on his typewriter in his grand house, strolling the streets of Barcelona and visiting his friends. 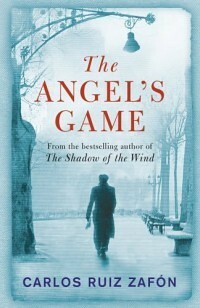 Then when strange things start happening and coincidences follow him, the novel gets really interesting. Martín can't help himself but to find out what really happened to Marlasca, the author who wrote a book in the Tower house, even though he can see he is destroying himself in the progress. I did find some of the characters in Martín's life somewhat one-dimensional, but on the whole, I completely enjoyed the journey we travel with him. I was on the cusp of giving the book five stars, but settled for four because of the 'twist' at the end. It skewed what had been my feeling about the book up until the last hundred pages or so. I felt like I had been tricked - of course, our narrator feels that way too - but somehow it seemed too twisty, too mind-boggling and sometimes downright confusing. It is unfortunate that the ending let down the novel Zafón created - it was more unsettling than satisfying, and there are many questions left unanswered. Even so, I would not say this is a bad book - I do immensely enjoy Zafón's writing style. He writes beautifully (even though I know it is a translation) and knows exactly how to write a book about books. It seems to set the reader's passion for books on fire. I also thought that Martín as a protagonist is likeable and seems like he will go far, which helps us to believe in his vision for the future. I feel like this year I didn't read as many amazing books as last year. I think I only gave a couple of 5 stars. Having said that, I did read way more books than I planned to...but only 2 books that I vowed to read! Eek! I read The Elite by Kiera Cass, and also The Perks of Being a Wallflower by Stephen Chbosky, which were on my 'vow to read' list. I enjoyed both of them, but they weren't my favourites this year. I really loved Dorothy Must Die, by Danielle Paige, and also Throne of Glass, by Sarah J. Maas, though, and I read quite a few books provided by NetGalley, some of which were good, some of which I wouldn't suggest. But one of the great books was Sidekick, by Auralee Wallace. Very cool. Oh dear, well I didn't do very well on the 50 book target, though I put part of this down to now working full time without commute time to read. This did mean I was more selective of the books I read, which was a good thing as most of them I actually really enjoyed. Out of the 5 books I've vowed to read Attachments and Say Her Name have been my favourites unsurprising as I love both Rainbow Rowell and James Dawson as authors. My sentiments on On The Road are well documented on the blog and and I've been really struggling with Norwegian Wood. If anything, this year of reading has brought to light what I really enjoy reading and what can be left on my TBR pile! Thanks to the addition of over 20 craft titles and other short reads I managed to read extra books again this year however just like last year I failed to find time for any re-reads so I'll be making more of an effort to fit some of these in during 2015. I also only managed to read four out of the five books I vowed to read this year but have The Night Circus sitting on my bedside table so perhaps I will pick it up soon! I actually quite enjoyed all of the four that I did read but my favourites were Ten & Forgive Me, Leonard Peacock. Woo! I did it! I didn’t expect to have made my target but I’m really happy that I did. I’m really pleased I’ve finally read Catcher in the Rye (even if I didn’t love it) so that I can tick it off the ‘must-read’ list. The one book I didn’t read on my vowed list, The Year of the Flood by Margaret Atwood, will definitely be getting read next year – it’ll be my January read. I went through stages of reading loads – i.e. during holidays, to months where I didn’t read at all. Still, I’m proud of having read 21 as it’s more than last year. I’m feeling motivated and I hope that I’ll be able to increase my reading even more next year. I have read three of my five vowed to read books from the start of the year (Chaos Walking trilogy, Cruel Summer and Ketchup Clouds), for the past few months I have been stuck on Any Human Heart by William Boyd, it took me quite a long time to get into it (surprised I didn't give up really) but I am now really enjoying it. My favourite reads of this year would definately have to be Cruel Summer, Say Her Name (both James Dawson), and Ten (Gretchen McNeil), these were all ones I couldn't put down! Don't forget to check back next month when we'll be sharing our 2015 goals! Georgie McCool is at a crossroads. Two days before she’s due to fly out to Omaha with her two daughters and her husband Neal, she gets her final shot to really hit the big leagues in her television writing career. But this means her staying in L.A. over Christmas and Neal packing up the kids and leaving her all alone. The night Neal and the girls leave, she discovers the old yellow rotary phone in her childhood bedroom somehow allow her to communicate with Neal from the past. Suddenly she’s faced with the ultimate dilemma. Try to fix her marriage before it goes into meltdown or try and stop Neal from ever marrying her in the first place. First things first, in the words of Rainbow Rowell ‘It’s a magic phone get over’. Once you’re past this one little plot point you can work your way into this wonderful little book. What drives the plot (and is weaved in with the supernatural/Notebook-esque magical phone element) is Georgie’s dilemma on whether to change the course of her’s and Neal’s life before they even go on this journey. And like all of Rowell’s novels this means placing the entire focus on the nature of human relationships. 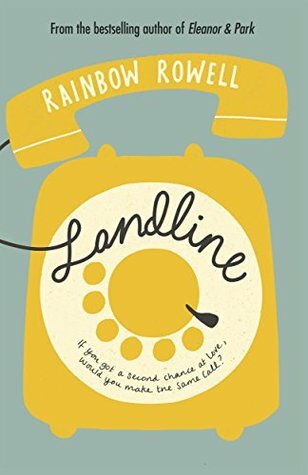 Landline, as a novel, showcases the highs and lows of a couple in love right from the moment Georgie and Neal meet, to the first sparks of their relationship, to their marriage and happy ending honeymoon period. But unlike a lot of contemporary romance novels we get to see past this initial period of bliss and into the slightly uglier side of the post-honeymoon slump. Rowell manages to capture every bitter details and euphoric high of their love not only through the conversations between Georgie and past-Neal but Georgie’s inner monologue. I could find myself getting frustrated at Neal seemingly unbounded patience when dealing with Georgie’s selfish-ness and constant let downs. Georgie herself is also a deeply flawed character, but what I really liked was her self-awareness of that fact. And it’s not just Georgie and Neal’s relationship on display, we also see how Georgie interacts with the rest of her family and her close writing partner/best friend, Seth. The dynamic between herself, Neal and Seth are particularly interesting, and I’m grateful Rowell didn’t take it down what I though would be a very typical Hollywood route of an affair. What I really liked the most about Landline was that it played out like a rom-com movie, complete with Georgie and Neal’s version of a happy ending. Though I did find the actual phone conversations less engaging than the flashbacks, all in all the plot and seeing this more realistic side of married life was really great. And the best bit about reading this at this time of year is that it’s set during the week leading up to Christmas, making it a perfect festive read! For lovers of…Attachments (Rainbow Rowell), The Time Traveller's Wife, and Nicholas Sparks. For those who may have missed it The Lizzie Bennet Diaries webseries is a modern adaptation of Jane Austen’s classic novel Pride & Prejudice which sees main character Elizabeth Bennet as an ambitious 24 year old in 2012, studying mass communications. As part of her thesis Lizzie decides to start making videos, sharing snippets of her life online with the help of best friend and filmmaker Charlotte. In this modern day version of events we meet Lizzie’s sisters hard-working fashionista Jane and party girl Lydia, as well as a whole host of others from the original novel brought up to date for a new audience. 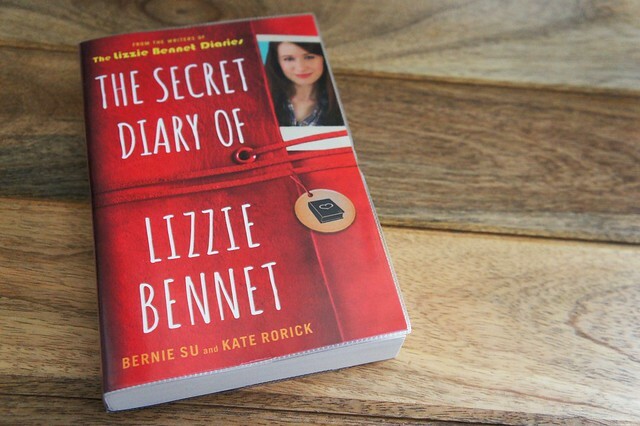 The Secret Diary Of Lizzie Bennet is an extension of the adaptation and as the title suggests the book is set out in a diary format with dated entries from Lizzie reflecting the events also shared in the webseries. Although covering the same time period as the videos the diary gives an extra insight into Lizzie’s life, including details that weren’t shown in the vlogs… and yes, one of those is the full version of Darcy’s famous letter. Personally I loved Lizzie’s character in the webseries (portrayed by Ashley Clements) and the same voice really shines through into the book. This coupled with the extra little snippets and closer look at Lizzie’s thoughts made the book a very enjoyable read that fans of the webseries will love. The Secret Diary Of Lizzie Bennet would be a brilliant last-minute Christmas gift for fans of The Lizzie Bennet Diaires or even perhaps those that adore the original Jane Austen novel. Welcome to our final group collaboration of 2014, once again we're each sharing our top 5 reads of the year! Hopefully you'll find some new titles to add to your TBR lists for 2015 but don't forget to leave a comment and let us know which books would make your top 5 for this year! Almost a year after the events of The Rosie Project, we find Dr Don Tillman and Rosie Jarman now happily married, living in New York in their small (but adequately sized) apartment, whilst Don has taken on the role as a visiting professor at Columbia University and Rosie studies for her MD qualification. Everything in their marriage so far has been smooth sailing - standardised meal system and part-time cocktail making and all - until Rosie drops the unexpected bombshell that she’s pregnant. In typical Don fashion there’s only one way to handle such an unexpected turn of events in his life…turn Rosie’s pregnancy into a nine-month project to prepare for the oncoming child that he will inevitably have to help to raise. Writing a sequel to the highly popular, The Rosie Project, was always going to be a tough feat. Throwing poor Don the pregnancy wildcard on paper should ensure plenty of laughs and an interesting spin to the character but I just couldn’t find the spark that I had whilst reading the first novel. Though the plot line itself was humorous enough, I couldn’t find myself getting on with Don as much as I did with the first book. Where his inept and overly-logical nature was endearing in The Rosie Project, in this story Don’s mishaps are more cringe-worthy than adorable. Whether deliberate or not, Simsion seemed to wrestle with making Don more human and sticking true to his analytical mind and because of this the mishaps he got into seemed much more unreasonable and easily avoidable. The other characters, however, did add a colourful spin to the book. Where Rosie was the only person with real interaction with Don in the first book, in contract she is very noticeably absent for a lot of the sequel. In her place we do have a much broader range of the couple’s friends from New York, not to mention a familiar face in Gene (one Don’s only friends from the original novel who has exhausted his wife’s patience and unceremoniously moved in with Don and Rosie). Gene adds an interesting dynamic to the couple’s lives, though his character traits from the first book are much more likeable in the sequel. The ending did make up for much of what the main narrative lacked. The comedic and ridiculous twist, coupled with Rosie’s more assertive presence and a much more classic version of Don’s bumbling nature, made for a really heart-warming wrap up to the book. 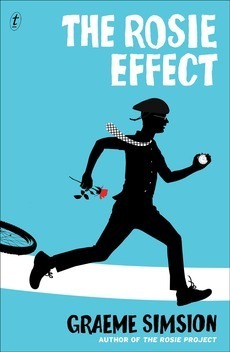 For lovers of…The Rosie Project, The Big Bang Theory and Forest Gump. “Something strange is happening at the Orsk furniture superstore in Cleveland, Ohio. Every morning, employees arrive to find broken Kjerring bookshelves, shattered Glans water goblets, and smashed Liripip wardrobes. Sales are down, security cameras reveal nothing, and store managers are panicking. Described brilliantly on Goodreads as a ‘traditional haunted house story in a thoroughly contemporary setting’ the book follows a group of Orsk employees led by Amy who is unhappy in her job and dislikes her colleague Basil. When she is called in to his office alongside fellow employee Ruth Anne Amy believes she is about to be fired but instead Basil asks them to work an extra shift. That night once the store has closed the three will team up to investigate the odd things that have been happening there. The story takes a spooky supernatural turn once night falls over Orsk and the group, joined by two more employees on a ghost hunt, find themselves trapped… but not alone. I wouldn’t want to give away any more information about the mysterious story itself however I do want to talk about the clever design – the element that initially drew me in. Intended to look like a catalogue for the fictional store Orsk this brilliant design reflects the story’s ‘knock off version of IKEA’ setting perfectly. Starting out with simple product illustrations of bookshelves, sofas and everything you’d expect to find in an IKEA catalogue, as the story progresses and becomes more sinister so do the design elements of the book. After wanting to get my hands on this book for months I was kindly sent a digital copy for review however I also picked up the paperback version to compare. In all honesty I would recommend reading the paperback if possible as you really get the chance to experience how the design element and story work together. This creepy tale was both intriguing and clever as well as an enjoyable quick read and would make a great addition to any coffee table – although one that might confuse your guests! If you’re a fan of classic haunted house horrors this refreshing twist on the genre will be right up your street! Your Favourite Reads Of 2014! Later this month we'll be sharing our favourite reads of the year and we'd love to hear about yours too! If you'd like to be involved in our December group post all you need to do is leave us a comment or send an email to bloggersbookshelf@gmail.com with a list of your top 5 reads of the year. We're looking forward to hearing all of your recommendations!